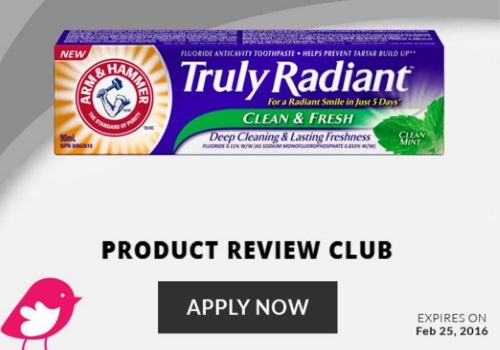 Chickadvisor has teamed up with Arm & Hammer for a new Product Review Club campaign! 200 Canadian women from our Product Review Club to try the Truly Radiant Clean & Fresh Toothpaste for free! If you're interested, please take a moment to complete the short selection survey at the link below no later than February 25, 2016. If you are selected, you will be notified via email the week of February 29. For extra consideration help spread the word on social media! Don’t forget to include #TrulyRadiantSmile when you post on Facebook, Twitter or Instagram.